ARK: Survival Evolved has consistently been one of the most played games since it hit Steam via Early Access in 2015. Now, with the release of the ARK: Extinction Expansion Pack, the team at Studio Wildcard has delivered new items, environments, creatures, and mechanics that further evolve the franchise. We recently had the chance to interview Chris Willoughby, Project Lead for ARK: Extinction, to learn more about how the game’s third expansion really mixes things up by taking the franchise to Earth. We also explore Extinction’s new Titan bosses, modes, and lore while finding out how the studio has grown over the years, how Pokémon had a positive influence on the project and how Unreal Engine 4 has helped the team throughout the development process. Thank you for taking the time to chat with us about ARK: Extinction. What were some of the goals you set out to achieve with the expansion? We are always looking to bring something new to the table with ARK. With Extinction, our goal was to introduce new mechanics and ideas that we have not been able to do before. Between the base game and two previously released expansion packs, we have created a vast amount of content for ARK players so far. So creating something completely fresh and unique can be a challenge. We think we have a good formula between the various creatures, Titans, and many new mechanics that players will enjoy in Extinction. Studio Wildcard co-founder Jesse Rapczak tweeted that ARK: Extinction is going to challenge and delight players in new ways. Can you explain how the expansion will accomplish this? Since ARK was first released, our team has grown substantially in both size and talent. We want to give players that joy of experiencing something new, but still hold true to the established ARK experience. This has involved revisiting some of our past successes and improving on those mechanics to elevate ourselves to the next level. We wanted to do the same thing for the player experience. Extinction will be on a level all of its own and players will be able to see the progress that we have made as a studio since 2015. Considering Extinction now takes ARK to Earth, can you provide the backdrop for the story? The survivors are aware that there is some overseeing force that has been creating these floating biodomes in space known as the ARKs. We know that this force has been collecting samples from all of history and bringing them back to life, preserving them in a way in artificial biomes. This is because Earth had fallen into disarray by the plague of Element. Element was able to infect the planet and the populations within it, which then drove the planet to extinction. 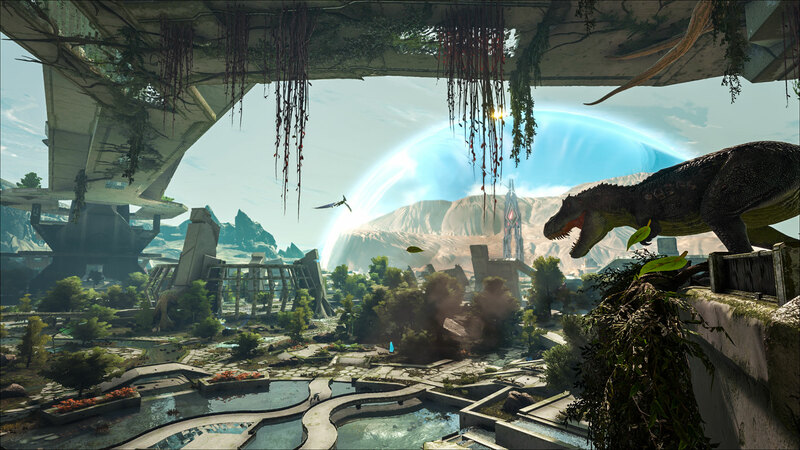 In ARK: Extinction, we will learn what exactly happened to planet Earth that caused that downfall to happen, and if we are able to save the planet and start its return to glory. 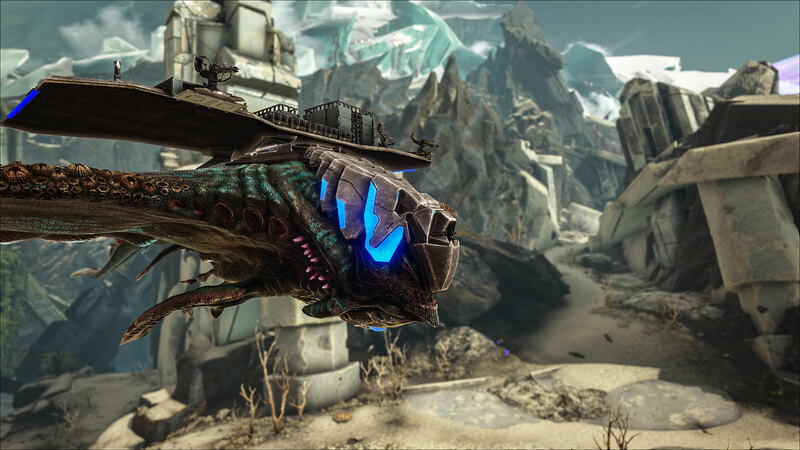 Where does Extinction fit in with the company's overall vision for the ARK franchise? Extinction is ultimately the conclusion to ARK’s current storyline. The burning questions in everyone’s mind have always been: how did we get here, and what exactly is an “ARK” anyways? Extinction finally answers both of these questions and more. Over the past few months, we have been teasing this storyline through events called the Extinction Chronicles. Each month we released new Explorer Notes into the already released game and expansion packs that hinted on the story that will unfold in Extinction. Can you talk about the new environments, like the overgrown city, you’ve built for the expansion? Since the expansion is located on Earth, players can expect to see some things that would be familiar to home. However, the Earth, prior to its present day downfall, was progressed further along than current technology has allowed in our lifetime. For example, one of the main areas as you’ve mentioned is the City, now overgrown and decayed, but still surveillanced by a protection force of Scouts and Enforcers. Players can discover other biomes with giant overarching domes, “Proto-ARKs,” containing within them the desert, tundra, and failed experiment: the Crater forest that lies beneath the city itself. The terrain outside of these areas has been ravaged by element, sulphur, and corrupted creatures. Studio Wildcard has revealed new, inventive beasts, with creatures such as the seemingly cuteGasbags to the perplexing Gacha. How many new creatures will the expansion introduce and how might they affect gameplay? 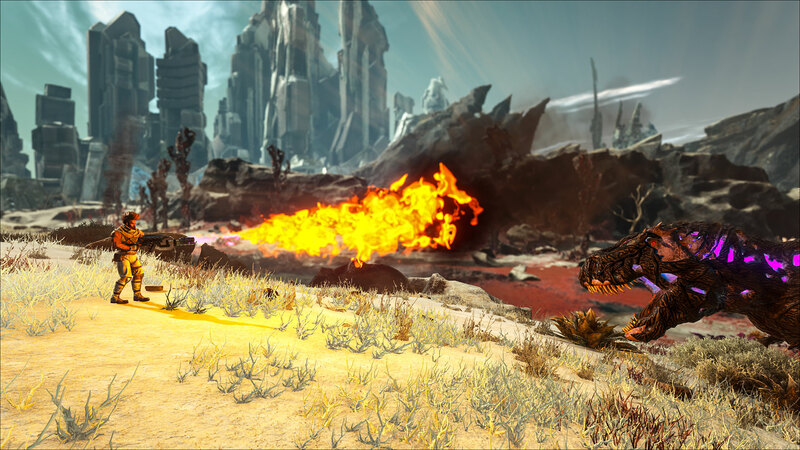 Extinction offers many new creatures: Velonasaur, Gasbags, Managarmr, Gacha, Snow Owl, as well as temporary tames—the Titans—and craftable creatures like the Scout and Enforcer. There are also the corrupted creatures of which there are many different types, but they are untameable due to their resistance to narcotics and aggressive tendencies. Each creature serves a specific purpose to the player and to Extinction as a whole. For example, the Gasbags is a beast of burden capable of hauling extensive amounts of materials and weight for long distances. It breathes in air and expels it through the lining on its stomach to be able to float gracefully--perhaps awkwardly--through the air. With each of these new creatures we sought out to fill gaps in our current lineup of creatures that allows them to be individuals and useful among hundreds of already established creatures. How will the new untamable corrupt dinosaurs in Extinction affect the world and gameplay? They are located in the most dangerous area on the map known as the Wasteland. True to its name, the Wasteland is extremely harsh and nearly uninhabitable to humans due to the ever dominating presence of corrupted creatures. While treacherous, this biome remains one of the most valuable to players, too. Players will be able to find Orbital Supply Drops in this biome which they must defend from waves of corrupted creatures at varying levels of difficulty. If successful, they will be awarded top-tier loot, some of which can only be obtained through these drops. Players can base up in this environment if they are able to protect their home from the corrupt, which are able to damage all structures, but it will be a very challenging experience for even for the most veteran of players. How does the studio come up with all of the interesting creature designs? Do members of the team research paleontology for inspiration? At the beginning stages, we like to pool ideas from everyone at the studio, this is something that we continue to do throughout the entire creative process. Everyone throws out ideas on what they’d like to see and we pick at the things that stick the most. By keeping everyone involved in the creative process, we are able to produce many unique ideas that may not be possible if we completely segregated the roles at our studio. We do also like to take influence and inspiration from many things, paleontology being one of those. We also have a deep appreciation for games of the past and pop-culture references. Can you talk about the massive roaming Titan mini-bosses in the expansion? Will players be able to tame them? Yes, some of the Titans can be tamed for short periods of time! Each Titan uses a different set of mechanics in order to take down the beast and convert it to your side. This also requires a decent amount of teamwork, as these are boss-level creatures and, once summoned, will be difficult to tame. 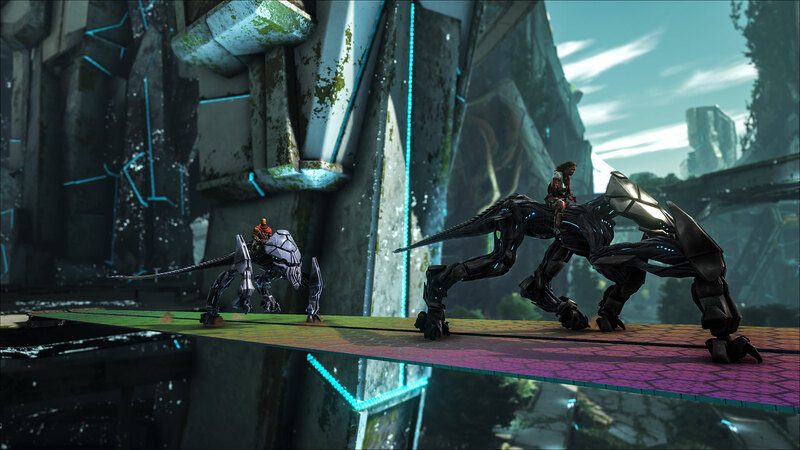 Once tamed, they have saddle platforms and players are able to build defenses in their backs like a giant moving fortress. Does Extinction introduce many new weapons and armor? The (literal) biggest addition would be both a combination of armor and weapon: the Mek. Mek’s are crafted by the player and then the player climbs inside their giant weaponized creation. There are multiple weapon types and ammo that can be given to the Mek to change its purpose. You can choose to shield your allies or shoot down your foes with a giant cannon strapped to the back of your Mek. A Mek is required for some of the highest difficulty gameplay on Extinction including Orbital Supply Drop (OSD) and the final boss fight. Extinction will allow players to freeze creatures into little ice cubes so that they can more easily carry them around. That's a really interesting mechanic. Can you talk about how you came up with this concept and what it might add to the game? One of ARK’s long standing requests has been a way to manage players hoards of tamed creatures in a meaningful and impactful way. 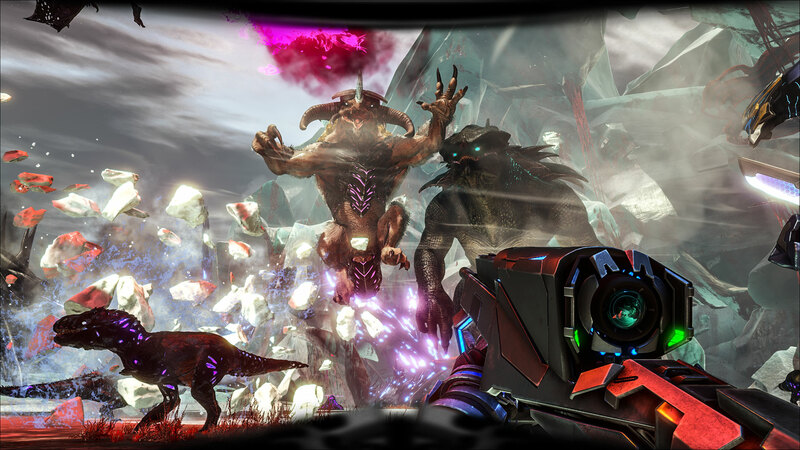 ARK does encourage players to tame large amounts of creatures due to needing a variety of harvesting creatures, egg laying creatures, and creatures for fighting. This new cryo feature allows people to pick and choose what creatures they have around their base at any given time without the negative side effects of having hundreds of mouths to feed, and does come with a performance boost especially if players cryo a majority of their tames. The actual implementation is very reminiscent of Pokémon, which is something many of us have played and enjoyed over the years. Extinction will introduce a new PvE event that incorporates tower defense-like gameplay. Can you explain how it works? This new mode is called Orbital Supply Drop (OSD). Essentially, players will trigger these randomly as they walk throughout the Wasteland. Once a supply drop plummets down from the sky, a tribe of players must defend it from taking damage against waves of corrupted creatures. If successful, they will be rewarded with loot that coincides with the difficulty level of the supply drop. There are four different difficulties: easy, medium, expert, and legendary. At the legendary difficulty it may be one of the hardest things we have ever introduced into ARK and will require substantial teamwork and investment to complete successfully. Does the team have a favorite UE4 tool or feature? Without a doubt it’s the UE4 Editor itself. All of the tools allow us to build content at a speed that we could not achieve any other way. Whether it’s materials, particles, gameplay scripting, or level design - we can build better things faster than we could anywhere else. Did the team use UE4’s visual scripting language, Blueprints, for Extinction’s development at all? We use Blueprints extensively in gameplay development. They empower us to make numerous diverse mechanics. In addition, the iteration time when working with Blueprints enables us to develop more with less, keeping the indie vibe while working on a massive game. Beyond that, we use Blueprints as a platform upon which we enable users to mod our game and then drop in their own logic and content, which allows them to take the mechanics even further. What has been the biggest developmental challenge to overcome? Balancing our team's passion for the project against time. There's so much creativity and enthusiasm for what we work on, day in and day out, that it can be tricky at times to rein in our ambition and shelve really cool ideas to ensure we hit our deadlines. That said, this "abundance of imagination" internally along with great feedback from our players allows us to have a pretty vast store of features to think about for the future. What has the studio learned from working on the franchise? ARK is our first game as a studio which I think comes as a surprise to people who have not known us since the beginning. We began as a very small team of developers working out of a team member’s house in the early days. Since then, we’ve grown considerably. There were growing pains as we had to scale up very rapidly to keep up with the demand from our audience. We wanted to deliver our passion to our players just as much as they wanted to experience it but ARK’s immediate success took us by surprise and it was difficult, and still is, to onboard people at a rapid rate who can keep up with the development process that is ARK. Over the years we have made significant progress. We now have two studio locations and dozens of remote employees from around the world. One thing we haven’t learned is to not underestimate your audience. Many times we think we have adequately prepared and our players show up in ways we didn’t expect and we have to scramble to online servers, for example. The amount of dedication from our players is something that we honor very much, but it still takes us by surprise. ARK: Survival Evolved has been one of the most played games for several years. What do you attribute this to? There is nothing else quite like ARK. That, as well as just how customizable the game is, has kept people playing for thousands of hours. There is a little something for everyone to enjoy. This was quite intentional when it came to developing an open-world game. We wanted all player experiences to be valid, up to and including plenty of modding support for those so inclined. This has allowed many talented creators to develop their own maps, creatures, and content for the game that benefits the entire ARK community greatly. Players can build, fight, tame, explore, and create stories of their own in the world of ARK and we think that is something very special. Thanks for your time! Where can people learn more about ARK: Extinction? ARK: Extinction is available now on Steam and is free to all ARK survivors who own the season pass. PlayStation and Xbox One players will be able to jump in game on November 13th. For any questions, you can also visit our community forums at survivetheark.com. Considering Studio Wildcard was able to make such a fantastically wonderful world with UE4, if you’d like to experiment building your own virtual world for free today, download and explore Unreal Engine.